Dr. Hisham Altalib, IIIT Director of Finance, presented the award to Professor Nyang at a special ceremony on the evening of Saturday, August 31, 2013. The event was part of a two-day program of intellectual panels organized by IIIT at its Hospitality Suite at the ISNA annual convention held at the Washington Convention Center during labor Day weekend. “IIIT is honored to recognize the outstanding scholarly achievements and community service of Professor Nyang. His life and work are that of a true public intellectual” said Dr. Hisham Altalib. In his acceptance speech, Professor Nyang expressed his gratitude to IIIT and praised its leadership role in defining the intellectual challenges facing the UMMA and paving the way for reform. Professor Nyang is a member of IIIT Council of Scholars. He was the founding editor of the American Journal of Islamic Studies, now known as the American Journal of Islamic Social Sciences. He was also a founding member and President of the Association of Muslim Social Scientists (AMSS). 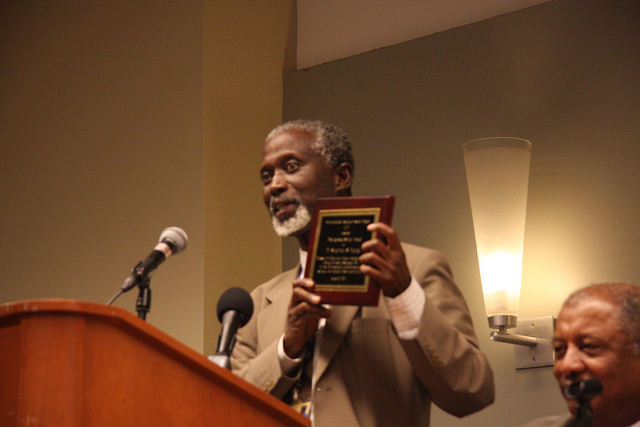 Dr. Nyang received a PhD degree in Government from the University of Virginia in 1974. Before he joined Howard University in 1972, he served as deputy Ambassador to Saudi Arabia representing his home country Gambia. Dr. Nyang has written and published extensively on Islamic, African and Middle Eastern affairs. His best known works include “Islam, Christianity and African Identity (1984); A Line in the Sand: Saudi Arabia’s Role in the Gulf War (1995). His latest book, entitled “Islam in America” is scheduled to appear this fall. This post was posted on October 19, 2013, 11:46 pm and is filed under News & Events. You can follow any responses to this post through RSS 2.0. Both comments and pings are currently closed.